The main character is the Mask - and no one knows who is hiding under it. It is the subject of riddle, magic, passion, mystery. 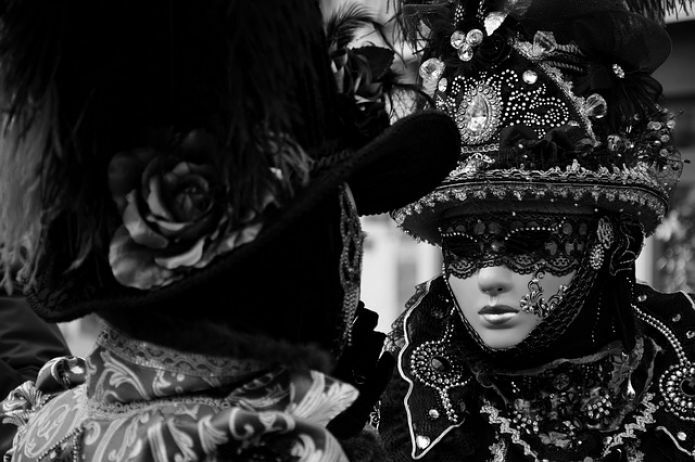 It is because of this mysterious hero in the Venetian carnival that it's so fun, interesting and festive. Communicating with each other, no one knows who is who. Under the mask you can hide for a while from anxiety, worries, uncertainty and sadness. The holiday takes place on a note of flight, soaring, extravaganza. Masquerade has a very ancient history, however, like Venice itself. Once there was a pagan holiday of the Roman Saturnalia: both slaves and gentlemen became equal during the period of its conduct, they could sit at a feast at the same table and even swear on an equal footing. And they drank wine of the same quality, laughing cheerfully and throwing jokes. It was on this holiday, so as not to spoil the mood because of the difference in estates, its participants hiding behind masks. Gradually the holiday became a heritage of Venice, took root as an integral part and became desirable every year to both indigenous residents and visitors to tourists. The greatest flourishing of Venetian masquerades reached in the XVIII century. People eagerly awaited them, because thanks to them they were liberated internally, fell into the world of dreams, thanks to a mask. But not everything was so smooth at carnivals: next to the fun were intrigues, losing big money, clarifying the relationship between rivals and much more. The historical character of Giacomo Casanova, precisely on these carnivals, turned his numerous amorous intrigues. But one day the holiday was interrupted and it was forgotten for 200 years. The reason was the murder of Marino Falero, a Venetian traitor. At the end of the XIX century, the holiday resumed and pleases everyone to this day. Everyone who wants to go to Venice, goes only for the carnival. And it is held in February. You can go either individually or as a group tour. In Venice, urban transport differs from ordinary cities: people walk either on foot or on boats of different sizes. Interesting views of the city and the holiday itself can be obtained at St. Mark's Square. Here once lived the Venetian rulers. At one time, Napoleon was very grateful for this area and called it the elegant living room of Europe. In the same square, the famous Hemingway liked to drink a cup of coffee, James Bond walked with pleasure along the square. The square is also famous for its tradition of feeding pigeons and photographing against the background with them. Here they also sell feed for pigeons, but because of the high cost, it is rarely bought. Not far from the Doge's Palace is the Bridge of Sighs, which most tourists want to get to: a guide will necessarily tell some. a romantic story. Numerous excursions are exotic and unique.